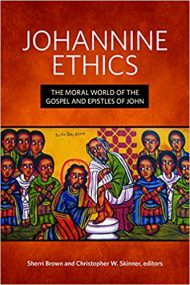 In just over two weeks, my forthcoming book, Johannine Ethics: The Moral World of the Gospel and Epistles of John (co-edited with my friend, Sherri Brown of Creighton University) will appear with Fortress Press. We have been planning and working on this book for over three years now. This is the eighth book project I have been able to shepherd through to completion and I am as eager to hold this book in my hands as I have been with any previous project. Looks good, but I’m confused by the subtitle. Is there a single essay or major section devoted to the Johannine Epistles?